Free Admission! Come out and see our students perform! If you would like more information on signing up your student for the recital, please contact their instructor for more information. This event is open to family, friends, and the general public We can’t wait to see you there! We will be meeting in the Costin Room of the library. Ask for the PAC Winter Recital when you arrive and the friendly staff will be glad to direct you! Free Admission! Come out and see our students perform! If you would like more information on signing up your student for the recital, please contact their instructor for more information. This event is open to family, friends, and the general public We can’t wait to see you there! Join us and bring your dancing shoes for an evening of Irish dancing and music! A caller will remind everyone of the steps even if you have never danced before. At $5/person - max $10/family bring the whole family! (no hardshoes, please) This is a great opportunity to get the family out of the house and moving in the middle of this cold winter weather. 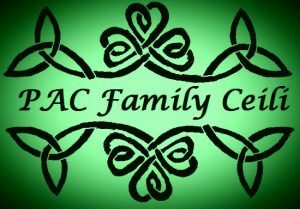 Enjoy great music, learn something new, and enjoy this taste of traditional Irish culture. Catch our talented students outside of Stop & Shop! They'll be playing for shoppers at the entrance while collecting donations to support all of PAC's wonderful programming. Come on out and support PAC families and programming, conveniently located near your next grocery run!